The Daily News of Open Water Swimming: Will You Still Be Swimming In The Year 2050? Will You Still Be Swimming In The Year 2050? Photo shows International Swimming Hall of Fame and International Marathon Swimming Hall of Fame dual inductee Michael Read at the 16 km Faros Maratón professional marathon swim in Croatia in 2015. In 1950, when Hassan Abdel Rehim from Egypt won the Daily Mail race across the English Channel in a record time of 10 hours 50 minutes, there were 205 million people who were 60 years or over around the world. In 2014, when Dr. Otto Thaning became the oldest individual in history to cross the English Channel in 12 hours 52 minutes at the age of 73, the number of people over the age of 60 had increased nearly fourfold to 810 million. In 2050, when Chloë McCardel will be 65 years old (with presumably more than 24 English Channel crossings that she has currently achieved), the number of older people on Planet Earth is projected to reach 2 billion. The demographic trends around the world are changing so much that people older than the age of 65 will outnumber children under 5 years according to the U.S. Census Bureau by the time of the 2020 Tokyo Olympic Games. By 2050, people 65 years and older are estimated to comprise of 15.6% of the world population while the children under 5 years will only comprise of 7.2%. Societies around the world are in the midst of the most dramatic demographic change in modern history. And the future is best seen through the lenses of demographic experts in Japan whose population peaked in 2010 at 128 million people. By 2050, 40% of Japan’s population is projected to be older than 65 years. Currently, 25% of Japan’s population is already older than 65 and its median age is nearly 46. Unlike many land-based sports, swimmers often swim well into their golden years. In the swimming world, the number of quinquagenarians (people in their 50’s), sexagenarians (people in their 60’s), septuagenarians (people in their 70’s), octogenarians (people in their 80’s), nonagenarians (people in their 90’s) and centenarians (people over 100) continues to increase - as a rapidly increasing rate. In 1979, American Olympic coach Doc Counsilman became the then-oldest person to swim across the English Channel at the age of 58. That English Channel age record increased when 73-year-old South African Dr. Thaning broke 71-year-old Australian Cyril Baldock's previous record. Dr. Thaning said afterwards, "My wish was basically to promote the idea that people over the age of 70 can do things like this if they look after themselves and work hard." Channel swimmer, health authority and renowned physician Peter Attia has written extensively about how one's lifespan and healthspan can be increased through healthful nutrition, periodic fasting, improved sleep and stress management. His Nerd Safari summarizes myriad research on a wide variety of topics here. But for many (most?) swimmers, swimming will remain a part of their exercise program and lifestyle. Looking forward to the year 2050, will Ferry Weertman (58 years old), Maarten van der Weijden (69), Kimberley Chambers (74), Ger Kennedy (81), Lewis Pugh (81), Yuko Matsuzaki (88) Ned Denison (92), Elizabeth Fry (91), Antonio Argüelles (91), Pat Gallant-Charette (99), Jim McConica (100), and Michael Read (109) still be swimming in 2050? Pat Gallant-Charette predicts her continued involvement in the sport, "If I’m still kicking in 2050 at the age of 99, I will be swimming. I have no intentions of retiring from marathon swimming. Last year at the age of 66, I set three records for the oldest woman to swim the English Channel, the Molokai Channel, and across Lake Ontario. It was my strongest year in swimming. I am looking forward to many future years of marathon swimming." Darren Miller, one of the few people who have completed the Oceans Seven, says, "My personal desire, and something I’ve thought about for quite some time, was to set the oldest English Channel crossing one day. Since I would estimate the age of that crosser to be well into their 80s by the time I get up there, I tell audiences that I have set a long term goal of crossing the English Channel in the summer of 2073, or during my 90th birthday year. I am looking forward to my wife, Alli, crossing with me well...but then again, she’ll only be 86 at the time." International Marathon Swimming Hall of Fame Honor Swimmer Penny Palfrey from Australia says, "So long as I'm able and have opportunity, I hope to swim well into my golden years to some degree. I quite fancy being able to amble into the water at the back of the pack and follow the crowd around the swim buoys. In 2050 I'll be 88. My grandmother is over 104 years old, so here's hoping!" Masters world record holder and veteran ocean swimmer Jim McConica who recently lost his home in the California fire says, "I lost about a month of water time due to the Thomas fire. I am just now getting my mileage and conditioning back. Last Friday and Saturday combined, I was finally able to get in 16,000 yards with some tempo. Long term, I do hope to swim until I die. We are very fortunate in Ventura [California] to have a top-of-the-line 50 meter pool as well as the ocean. Our long distance group is outstanding. We are all friends. The group support makes success both possible and fun. This environment should give me every chance to continue swimming for a very long time. Years ago I was quoted as saying I hope to swim until I am 120 and have people say I swim like an 80-year-old. That is still my hope. The loss of my home has been more than tough. In minutes, forty years of history, work and memories went away. I try to stay positive, thinking I can only worry about things I can control. The rebuild process is creating its own challenges. Swimming has always been a positive force in my life. I feel very fortunate to have that stability, particularly now." International Swimming Hall of Fame and International Marathon Swimming Hall of Fame dual inductee Michael Read says, "I hope [to continue swimming]. I still have ambitions unfulfilled and I still need time to be able to accomplish them, So much to do, alas, so little time to do it." International Marathon Swimming Hall of Fame Honor Swimmer and United Nations Patron of the Oceans Lewis Pugh agrees, "[I plan on swimming] till my last day." Oahu-based veteran channel swimmer Bill Goding predicts, "In 2050 I will be 97 years old. I do plan on continuing swimming till then, mainly for the health benefits and the advantage of it being non weight bearing, yet still exercising all the muscles. And, maybe by then I might break a world record of some event, but I have a feeling the competition will be tough." RCP Tiburon Mile founder Bob Placak says, "Swimming has been an integral part of my life since I was 6 years old. It is a priority that I look forward to daily and anticipate with joy. I truly enjoy the way it makes me feel mentally, spiritually and physically. The impact to my health is immense. Swimming allows me an outlet to compete, a legitimate way to channel aggression and set goals of achievement. I don’t drive aggressively and competitively like many do, I have an outlet to channel. Swimming will have to be taken away from me. I’m not going to willingly give it up. I will strive and I anticipate, God willing, that I will still be enjoying swimming in 2050 at age 91." 58-year-old Mexican Oceans Seven swimmer Antonio Argüelles thought he was old at the age of 40 when he first swam the English Channel in 1999. "Ximena came along and I thought it would be the last time she could see me drift into the water or emerged at the other end. While swimming, I thought about how great it would be to celebrate her birthday in Paris days later. As I was immersed in that thought, a big wave splashed in my face and swallowed the most salt water in my life. A big lesson was thought; do not let your mind wander while you swim. After 18 hours 19 minutes, I swore by the Virgin of Guadalupe that I would never do ocean swimming again. Ten years later, trying to accomplish the Triple Crown of Open Water Swimming in one season, I had only one day left in my window to swim the Channel, when Mike Oram told me that even when the weather was not good, he would give me a chance to feel the water. I went in knowing that if I failed that day, my quest was over. As the waves pushed me side to side, I remember thinking that this was my last swim, that I had to give all I had because I was 50 and my days were over. Once I reached the other side, I thanked the ocean Gods and promised never to go back to swimming. My quest for Everest ended with a broken femur and rehabilitation in the water. Oceans Seven was born somewhere there and a new light was brought into my life. In my last swim across the North Channel, the odds were against me. Quinton Nelson told me the day before my window ended that swimming was almost impossible. That night I went to bed with two thoughts in my mind: (1) if I did not swim I would be able to enjoy one more year training, and (2) if I had the opportunity I would finish. The morning after the swim Lucía and I had breakfast, she asked me if I was happy. When I said I did, she made me promise that for two years I would not embark in any other crazy journey. She wanted our family to have vacations that did not include swimming. I agreed and next Wednesday we are leaving on a trip to Poland, Hungary and Croatia for three weeks. In the future, I have booked an attempt for a double crossing of the English Channel in 2020, mostly inspired by Sal Minty-Gravett and Liz Fry's successful crossings. Then there is the Farallon Islands and always, at the top of the clock, a Catalina Channel crossing. California is my second home, so if I am alive at 91, I wish I had finished a swim with one of my grandchildren the previous year." Sal Minty-Gravett who will attempt another English Channel crossing in her sixth consecutive decade in the year 2020 says, "I will be 93 in 2050, but I clearly hope I will still be sea swimming - but I doubt that I will be swimming the Channel still - but who knows?!?" Ice swimming record holder Rory Fitzgerald says, "As someone once said, 'I plan to live forever...so far, so good...' So in 2050 I shall probably be, at 92, the oldest adolescent in the pool. I certainly plan to keep swimming, chasing the likes of Ned Denison and Ram Barkai for those age group records and titles in the water. Maybe by then I shall have figured out some of the flaws in my stroke technique and be able to mitigate the wear and tear injuries that are so prevalent amongst the growing population of silver swimmers. 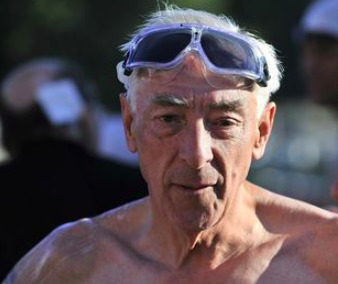 But I say bring it on – I shall be looking for podium finishes as long as I am still able to climb onto the podium..."
Same with International Ice Swimming Association founder Ram Barkai, "I'll be 92 years old in 2050. If I'm alive, I'll be swimming." British Ice Ironman Andrew Ainge says, "I will be 80 in 2050 and probably still chasing my final Ice Seven swim." Catalina Channel record relay member Dr. Lyle Nalli admits, "2050 would put me at 90 years old. Will I be swimming? Most likely. Swimming the mile? Not sure. 100 meters seems a long way to swim for the nonagenarians I watch swim." Swim Across America CEO Rob Butcher says, "I just turned 45 and I hope to still be going in 50 years, go get some records in the 95-99 age group." Coney Island Polar Bear Club senior member Tom McGann says, "I'll be 96 so I hope to be swimming in 2005. I'll be in the slow lane."